rick jacobson | THAT'S ENTERTAINMENT! This is an incredibly powerful episode that takes the series into one of the darkest places its been since the Rift in Season Three, as Xena’s daughter kills the elderly Joxer. It’s a difficult episode to watch because of this particular loss, one of the series’ biggest. As I mentioned last week, this episode is stronger than “Livia,” particularly because of Xena, Gabrielle, and Livia/Eve, who go through even more emotional turmoil. Their intense melodrama is matched by some masterful action sequences directed by Mark Beesley, culminating in one of Season Five’s best fights, as Xena and Livia face off in the cathedral. Livia’s turnaround at the end of the fight is a bit of an “Eli ex machina,” but it’s beautifully done, and furthers the wonderful arc for her character. “Eve” is an excellently made episode (despite my previously mentioned distaste for Wilkinson), that simply isn’t the most enjoyable because of its heavy story. Here are scans of an interview that writer George Strayton gave on “Eve” for The Chakram Newsletter: #14. I featured this episode as #34 on my list of the 60 best episodes. Read my thoughts here. Here are scans of an interview that writer R.J. Stewart gave on “Motherhood” for The Chakram Newsletter: #13. 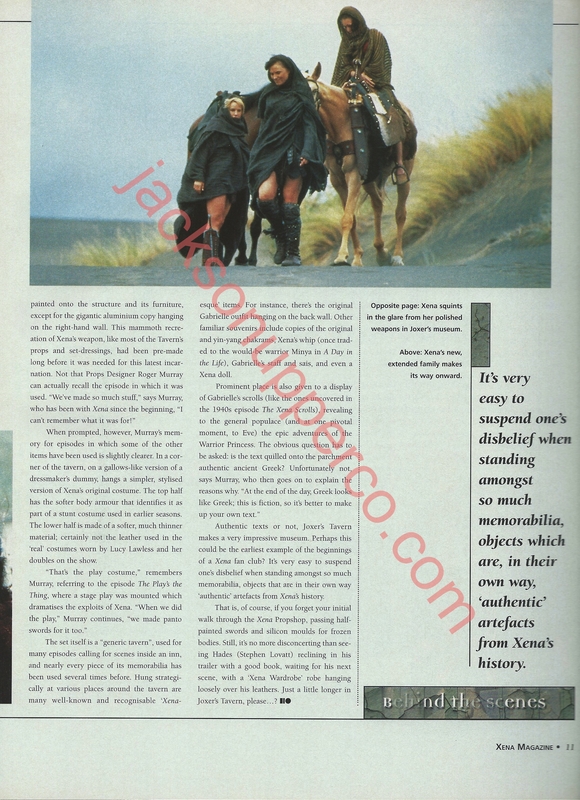 Here is an on-set report of the production of “Motherhood” from Titan: The Official XENA Magazine, Issue #8. 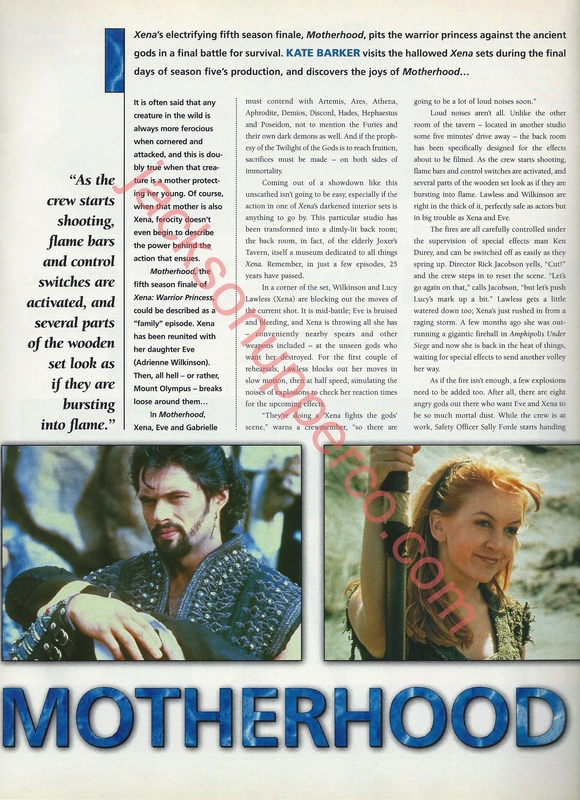 Here is an on-set report of the production of “Motherhood” from Titan: The Official XENA Magazine, Issue #11. *You can check out extended and deleted scenes from “Motherhood” on the Season Five DVD Set!